It is always wonderful to get an opportunity to work in a domain (Marketing & Business Development) what I envisioned doing in future, and my belief is strengthened through my journey here at Soul flower. The first two to three days were very insightful – knowing more about Soul flower, what the brand stands for, its strategy, the concept of Spa@Home, the experiential nature of the products and the business channels. My first project started with detail analysis of customers and reviewers in online platform Amazon.in through which I get to know much about how E-commerce firm like Amazon works with vendors and what kind of strategy a firm should follow to delight their customers who likes buying online. I am glad to do my summer internship in soulflower because of the wonderful opportunities to work in multiple profiles. The pricing strategy project, where I got an opportunity to come up with a strategy to launch our product in new market. And next the creations of order generation template and vendor registration form in which I constantly visited factory and got a real time view of how various products of Soulflower are manufactured. The internship as a whole made me business oriented, I got to learn more about how corporate works. 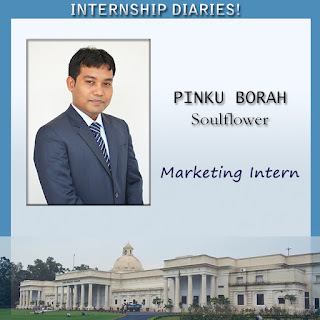 My stint at Soulflower improved traits in me like persistence, confidence and responsiveness. It is truly a wonderful experience of working directly under the guidance of the Managing Director of the company who have motivated and encourage me to successfully complete every task assign to me.